Teknotherm has always been at the forefront of freezing solutions for the fishing industry. Just in the last 4 years alone, we have delivered over 50 horizontal plate freezers to factory trawlers based here in Seattle fishing in the Bering Sea. We are THE freezing experts. 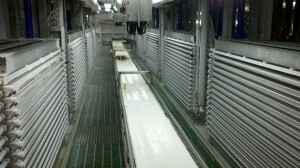 A mainstay of the fishing and food freezing industry is the plate freezer. These freezers allow fast, efficient freezing of large quantities of product, down to -60. 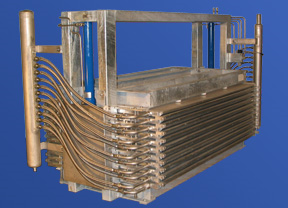 We can supply plate freezers from Jackstone, DSI, and others, and can custom-design the refrigeration to run it. For many years, Teknotherm has upgraded existing refrigeration systems. We can analyze your current system, and make recommendations about improving efficiency and maximizing profits. Our experience translates into accurate estimates on build times and cost, optimal performance, and the highest possible efficiency. Call us today to learn more. 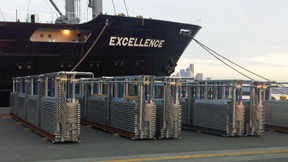 We recently designed and installed a major freezing upgrade on the F/V Excellence. This system employs 24 plate freezers controlled by a custom Teknotherm PLC-based automation system. Features include touchscreen control and remote internet monitoring and control capability. Founded in 1926, Teknotherm is a world leader in the field of marine and industrial refrigeration. Our products can be found throughout the world – the United States, Africa, South America, Australia, Europe, China, the Middle East, all the oceans and many of the lakes. We are located in Seattle, Washington and have extensive experience throughout Alaska, the Pacific Northwest, Gulf of Mexico, and the Eastern US seaboard. Learn about about our design & fabrication services, refrigeration system repair & maintenance, automation & controls, parts, and much more. Includes our line card showing some of the parts and materials you can get through Teknotherm. Teknotherm Refrigeration specializes in installing and servicing all types of RSW systems, ice makers, chillers, and condensers for fishing vessels, offshore oil rigs, maritime support ships, and cruise ships, as well as land-based industrial freezing systems. We manufacture chillers, refrigerators, condensers, and ice machines at our complete design and fabrication facility in Seattle. Under our TeknoLogic division we design and build our own system controls and automation by hand in our UL listed panel shop. And our Parts Department is second to none. With nearly 100 years experience and sources all over the globe, we can probably find whatever you need. Whether you're looking for compressors and valves or that strange piece from your 20 year old chiller, call us at 800-782-1997 or e-mail Teknotherm Parts today. Subscribe To Our News & Updates. Enter your email address to receive notifications of new news by email.